Underneath most flooring is a concrete slab. And, if the type of flooring on a concrete subflooring is tile, thinset is used to hold the slab of concrete and tile together. Part of the tile removing process must be to remove this layer of thinset. Otherwise, the subflooring may not be equalized and new flooring is installed off kilter. While you can certainly attempt to remove this thinset yourself, hammering away with nail and chisel, you can also have the whole flooring removed in one simple process. You may have removed flooring yourself only to find a thick, uneven layer of thinset underneath. 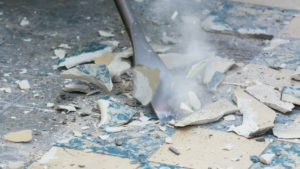 Or, you haven’t even started the flooring demolition project but are wondering about removing thinset as well. In either case, it is possible to remove thinset yourself. Basically, by hand, you can use a hammer to crack the thinset and gently chisel away at the material until it crumbles apart. However, it’s very important not to damage the cement subflooring underneath. If the subfloor is damaged, you could compromise the structure of the entire flooring. And, dig an even deeper hole in your pocket to repair the mistake. All in all, it’s regularly suggested that the best way to avoid complications with subflooring and thinset is to have a professional remove thinset for you. Sure, the contractor you’ve hired to install your new flooring could go ahead and remove your tile and also the thinset underneath. However, they are going to include this in the price of your entire flooring remodel. So, if this is the route you go, make sure that you understand specific charges for the flooring and thinset removal. But, there are other red flags to consider besides just price. 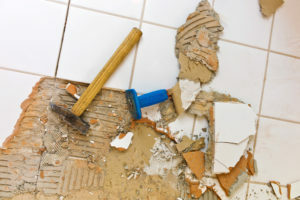 Since a flooring contractor will only have handheld equipment and manual workers, the labor of removing flooring and thinset will require days of chipping, hammering, chiseling, and hauling. And, since this entire process releases mass amounts of dust into the air, you can expect not to be able to be in the home or business for some time due to safety reasons. Additionally, you can expect to be cleaning dust from this manual construction process for the next few weeks. This means a longer timeline for your project and more of a hassle for you. Dust Free: Our system removes both flooring and thinset without dreaded construction dust. This means no intensive cleanup after we leave. And, you won’t have to leave the comfort of your home or your business establishment while we get the job done! After removing flooring and thinset, we leave subflooring clean and ready for immediate install. Speedy: Since we utilize an innovative dust-free system and our experts have been professionally removing all types of flooring for years, we usually don’t need more than a few hours to remove flooring. So, this means staying on schedule with your renovation timelines and getting your new flooring installed faster! Affordable: Our process includes the removal of flooring, removing thinset, disposing of debris, and clean up. So, you get an all-in-one service for just one price! Obviously, each job is priced differently according to size, but our all-inclusive service is well worth the price. Looking for thinset removal in South Florida? Give Dustbusters Floor Removal a call today at 866-883-8783 to schedule an estimate consultation!